Bright white outer. bright white upper. bright white laces. All white everything. The Soma II is the quintessential white mid-top, finished with a comfortable rubber sole that is decoratively patterned with the Pointer logo. In terms of branding, Pointer are very subtle in the way that they present their logo/symbol, and this adds to their collection, placing greater emphasis on the distinctiveness of their signature designs. The robust full grain leather outer comes with minimalistic stitching, and this characteristic gives the shoe a casual, but sleek look. 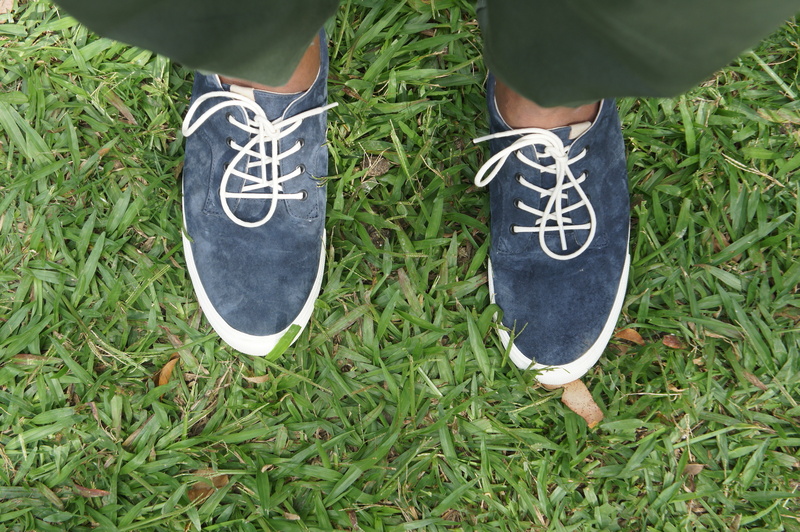 One thing about these shoes that we were really drawn to was the versatility of them – we could wear them dressed-up with cuffed chinos, and also in a more laid-back, Australian summer style, with just shorts and a shirt. The Pointer Footwear notion of reinventing the classic to align with contemporary fashion seems to shine through with the Soma II, because in times when designs and trends are changing radically, having a pair of shoes that are adaptable, yet expressive in their own right, is valued greatly for everyday wear. We took the Soma II’s on holidays with us and found them to be a really quite comfortable fit for a casual sneaker with such a bold aesthetic. Although it appears very similar in design to a Converse All Star Chuck, these sneakers present with strong padding around the ankle, and a wider sole providing greater room and comfort. The Pointer A.F.D is not your average low top. From a distance, the deep, blazer blue colour contrasts against the white rubber midsole and laces. From close, the upper of the low top is constructed from high quality nubuck leather, and the blazer blue has a neat denim aesthetic, which presents as unique use of materials. Like the Soma II, the rubber sole is patterned with the Pointer logo, and this sneaker also comes with an OrthoLite Insole, which is an open cell foam structure providing greater breathability, cushioning and overall durability.